Immigration officials have detained 17 construction workers in a raid on a £45m housing development. 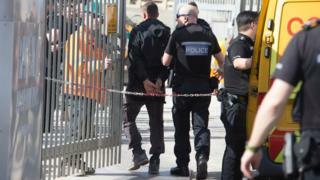 The Home Office said that 11 of the men had entered the country illegally and six had overstayed their visas. They have been detained "pending removal from the UK". Roffey Homes, which is building 141 homes in Brighton Road, Worthing, said it only employed local people but a sub-contractor had recruited "labour from outside of Sussex". It said: "This sub-contractor is responsible for carrying out their own checks before sending their labour to site. "Although it is their responsibility to carry out thorough checks on their workforce, we shall review what additional procedures we can implement to ensure that only those who are legally allowed to work on our site are able to do so." The Home Office said 10 men aged 18 to 31 were from Albania and seven aged 28 to 63 were from India.